Book Number One in the Under Texas Stars series A love like Lucy and Nate’s only comes along once in a blue moon . . . Lucy Marsh's worldly resources are running out, but she's fiercely determined to care for her younger brother and sister. When she discovers that their father's recent death was no accident, Lucy is eager to leave town. She accepts a proxy marriage she believes will provide safe refuge. But trouble follows her to Texas where her new husband is surprised to suddenly have a wife and children to care for. Nate Stanton always hoped he'd marry someday, but running the family ranch meant he had no time for romance. When his father deposits Lucy Marsh—a city girl—on his doorstep, with two siblings in the bargain, he expects ranch life will send her running on the first train out of town. But Lucy is made of tougher stuff than Nate imagined. When danger moves in, Nate finds he'd give anything to protect Lucy and the children he's grown to love. Even if it means giving up his ranch. This is my first Coleen Coble book. In the past, I haven't picked up her novels because they seemed to be contemporary romance (which I am not a huge fan of). I loved this novel! It was incredibly action packed and took both the characters and the reader on a roller coaster ride. From the very beginning of the book, Lucy Marsh has had a very difficult life. We meet her as she is in a very difficult position- within one day she both loses her job and home and has no way to support her siblings. When an unexpected offer comes her way, Lucy takes it, hoping to find the family and home that she has always desired. I loved the main characters, Lucy and Nate. I enjoyed that they didn't instantly love each other, or even like each other. I loved that they were both flawed- there is no perfection with these two people. The author did a great job making the situation and the people believable, and the book didn't feel predictable. This is a book that doesn't stop. There was humor, love, and a whole lot of action. I recommend this book to anyone who is a fan of historical fiction. 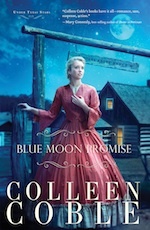 Blue Moon Promise is a story of hope, romance, and suspense . . . immersing the reader in a rich historical tale set under Texas stars. 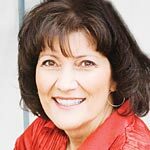 To celebrate Colleen is teaming up with her publisher Thomas Nelson for a "Blue Moon Promise" Facebook Chat party where she will giveaway a KINDLE Fire and a Texas-sized gift basket (fabulous Texas treats and fun Lucy-inspired housekeeping products)! Click the banner, RSVP today for the Facebook Party and mark the date on your calendar! Invite your friends and don't miss Colleen's evening of chat, trivia, prizes, and more. Button Code: Kindle Giveaway and More! Save the Date - 3/13!